Newcastle trainer Darren Smith admitted using cobalt, supplied by a disqualified person, on all the horses in his stable with one reading so far off the scale a statistics professor could not give odds on it occurring naturally. Racing NSW opened the inquiry at the Druitt Street headquarters on Friday on Smith's use of cobalt and asked the trainer about his association with disqualified trotting trainer Shannon Wonson. "He had been to my place to look after my daughter's show horses because of bowed tendon," Smith said. "He gave me one bottle that he said was a blood booster and I used it. I would give about 2ml to 2.5ml to horses to help them with recovery." Smith claimed he later learnt it was cobalt, but admitted to hiding in his stable so it would not be found. He has been stood down as a trainer since a stable raid on May 30. Stewards have 16 samples from 13 horses that have been certified by two laboratories to be high concentrations of cobalt. The highest reading was from Testarhythm when he won the Ortensia Stakes at Scone on May 17. It was found to be 6470ng/mL of cobalt in the A sample, while the B sample was 6200ng/mL. Given 50ng/mL would be considered a high cobalt reading on an untreated horses, these numbers were extraordinary. Statistic professor David Hibbert, who has been doing an analysis for racing authorities to set a threshold for cobalt, produced odds for each of the readings from Smith's horse compared to a normal of 50ng/mL. The lowest reading from the horse tested trained by Smith was 224ng/mL, which would be a 17,925-1 chance, according to Hibbert, and the chances went up from there with at least eight of the readings being odds of more than 1,000,000-1. The Testarhythm figure was "too huge to calculate a number for", according to Hibbert. Racing NSW does not have a threshold for cobalt under its rules and Smith was aware of that after a call to chief vet Craig Suann in April when Harness Racing NSW and Racing Victoria bought in thresholds for cobalt. However, he kept using the blood booster, which increases red cell production. The inquiry heard from Smith and Suann as well as expert witnesses in Professor Paul Mills and Doctor Glenn Robertson-Smith in a five-hour hearing, which was adjourned to allow Smith's lawyer, Paul O'Sullivan, to review evidence before making his final submission. Chief steward Ray Murrihy indicated that there was no threshold for cobalt in NSW, so stewards would look to Australian Racing Rule 177B (2) (l) and 178B to proceed with the case. The first rule deals with "hypoxia inducible factor (HIF)-1 stabilisers, including but not limited to ITPP", while the second states "substances capable at any time of causing either directly or indirectly an action or effect, or both an action and effect, within one or more of the following mammalian body system". Much of the evidence was pointed at whether cobalt fell under the definitions in these rules. The case was adjourned to a date to be fixed, which will be in the new year. This bloke just needs to be rubbed out of racing! He is a serial criminal who needs to be gone! If horse racing EVER let him have a license again, that is it. PHOTO: Newcastle trainer Darren Smith used the additive cobalt chloride on 13 runners last year. A Newcastle horse trainer, caught in a doping scandal has argued against a ban, saying he consulted racing's governing body about the substance it is pursuing him for. Newcastle trainer Darren Smith used the additive cobalt chloride on 13 runners last year. It mimics the performance enhancing drug, EPO. There was no cobalt chloride threshold in New South Wales at the time, but there is now. His solicitor, Paul O'Sullivan, said Smith went as far as asking a Racing NSW vet to confirm there was no threshold, before using the substance. "To use an analogy, it's like a drug dealer ringing the police and saying, 'I intend to sell something - is it legal or not?'" he said. He has lodged final submissions to the inquiry into his matter. Cobalt detection also has three leading Victorian trainers on edge. The difference with their cases is that there was a threshold in place in Victoria when the substance was detected in their runners. Racing NSW is not commenting until the matter is finalised. 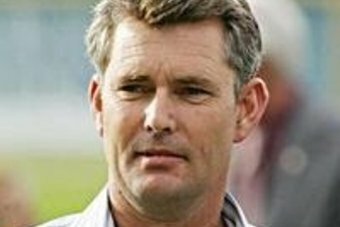 Ray Murrihy, Chief Steward Racing NSW tells @SkySportsRadio1 Stewards panel meeting Monday over Darren Smith cobalt cases. Decision pending. His solicitor, Paul O'Sullivan, said Smith went as far as asking a Racing NSW vet to confirm there was no threshold, before using the substance.</p><p>"To use an analogy, it's like a drug dealer ringing the police and saying, 'I intend to sell something - is it legal or not?'" he said. If I were Mr. Smith I'd be looking for new counsel. There was no threshold, doesn't mean he didn't break the rules. Racing NSW stewards have issued a total of 61 charges against trainer Darren Smith in relation to his alleged cobalt use. The charges are set out under AR175h(ii), AR178 and AR177B(1)(a) which encompass the presence of a prohibited substance in a horse’s system. Darren Smith first came under the stewards’ spotlight back in May of last year when evidence of cobalt administration prompted the entire stable to be stood down from operation. The Newcastle-based trainer has been before the stewards on eight previous occasions for treatment-related offences but none more significant than the current inquisition he finds himself in. Stewards have released a total of 21 instances of a Smith-trained horse testing positive to cobalt, 20 of which were in races. The list of samples stretches over a period of more than three months from February 14 last year to May 21. Eleven of those that tested positive in competition won the race while another four finished in the placings. The one positive sample returned out of competition was that of Nisroc on May 20. Owners of the horses in question have been sent notices that at the resumption of the inquiry, they will be given the opportunity to call evidence as to whether the disqualification of their horse should apply. Meanwhile, Racing Queensland expects the results of B-samples from horses that have returned Cobalt irregularities to be available next week. at the resumption of the inquiry, they will be given the opportunity to call evidence as to whether the disqualification of their horse should apply. Its called natural justice, WOD. If you are considering a penalty you give the condemned an opportunity to make a submission in regard to mitigating circumstances or whatever else they want you to take into account before you make your final determination. Just part of due process; all good. On 24th February 2015, licensed trainer Mr Darren Smith, assisted by legal counsel, Mr Paul O’Sullivan answered a total of 62 charges issued by Racing NSW Stewards under the Rules of Racing relative to the analyst's findings of elevated levels of cobalt in 20 raceday and one non-race day sample between 14th February 2014 and 21st May 2014. DARREN Smith has become the first trainer convicted of cobalt offences, with Sydney stewards finding him guilty of more than 40 charges. Smith faced 62 charges at a hearing last week relating to high levels of cobalt found in horses from his stable. He admitted injecting horses with a substance obtained from disqualified harness trainer Shannon Wonson who he said described it as a blood booster. Got off light, should have got that several charges ago. He has already appealed it. Don't give him much chance of getting off though. Oh, I give up ratsack, you are far too smart for me.